Photo Source University of Wisconsin-Madison. “We must build and maintain the track structure the right way or Railroad Safety, Quality, and Integrity will be compromised and this great industry will (literally and figuratively) derail.” – Excerpt from Track Guy Consultant’s Mission Statement. Event-goers of NRC-REMSA 2017 Conference earlier this year are no doubt familiar with John Zuspan; not only did he present a seminar on “Means and Methods for Direct Fixation, Low Vibration Track & Embedded Track” (a talk on the means and methods for DF, LVT, and embedded track construction), he was honored and inducted into the NRC Hall of Fame. Throughout his 40+ year career, John Zuspan has worked in the various complex roles that make up our railroad industry. This journey first began with a job as a track laborer for Atlas Railroad Construction, where Zuspan learned first hand the tangible, physical requirements of railway assembly. This knowledge would serve him well in his next role, Superintendent for Slattery/Skanska. Zuspan’s work ethic and drive resulted in his elevation to Director of the Track Division. Vice President for Balfour Beatty Rail was the next post Zuspan assumed, estimating and managing budgets for several large scale railway projects and being responsible for hundreds of track workers across three boroughs. It’s no exaggeration to say that John Zuspan has an inside knowledge of all complex facets that make the railway industry run. This passion and perspective, gleamed through a decades of work, would lead to his next endeavor: Track Guy Consultants. For his decades of service towards improving the quality of railways and railway employees, as well as his on-going passion to offer the tools and information new generations of railway workers can use, we name John Zuspan our Featured Innovator of the Month. We look forward to hearing more from him in the future! Note: John Zuspan does not work for nor is he affiliated with Willamette Valley Company. Photos courtesy of Railway Engineering-Maintenance Suppliers Association (REMSA). 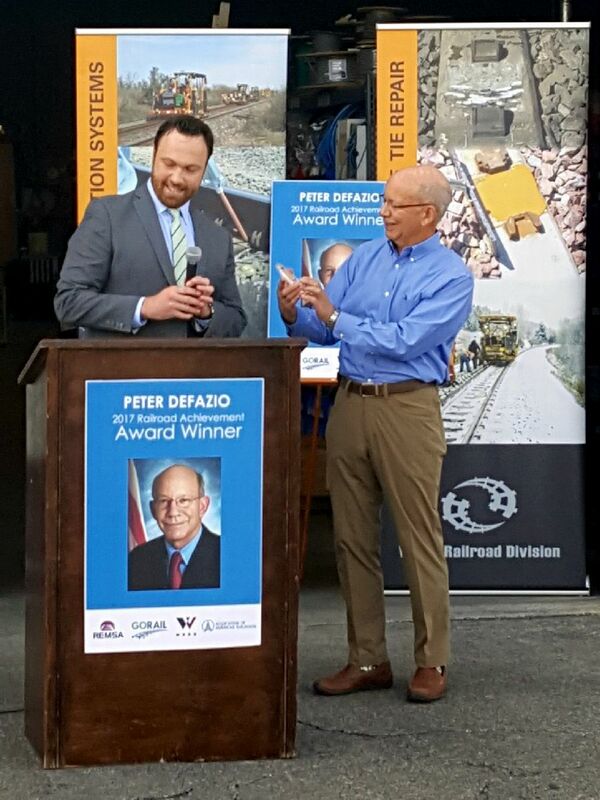 Congressman DeFazio, a ranking member of the House Transportation & Infrastructure Committee, was recognized at this event for his support and leadership on issues affecting both freight and passenger railroads. The Railway Engineering-Maintenance Suppliers Association (REMSA), which represents WVCO, as well as eight other Oregon rail manufacturers, coordinated the event. WVCO ‎Vice President John Murray introducing distinguished guests at an event honoring Congressman DeFazio.